With their spectacular glowing arms, grand spiral galaxies seem to get all the attention — but NGC 6822, a barred irregular dwarf galaxy, proves that regular spirals do not have a monopoly on galactic beauty. Also called Barnard’s galaxy, NGC 6822 is located in the constellation of Sagittarius just 1.6 million light-years away and is brimming with rich star formation regions. This new image is a composite of older observations made with the Wide Field Imager attached to the 2.2-metre MPG/ESO telescope at ESO’s La Silla Observatory and new data collected by the Atacama Large Millimeter/submillimeter Array (ALMA). The areas observed with ALMA are highlighted in the image and can be seen here in detail. 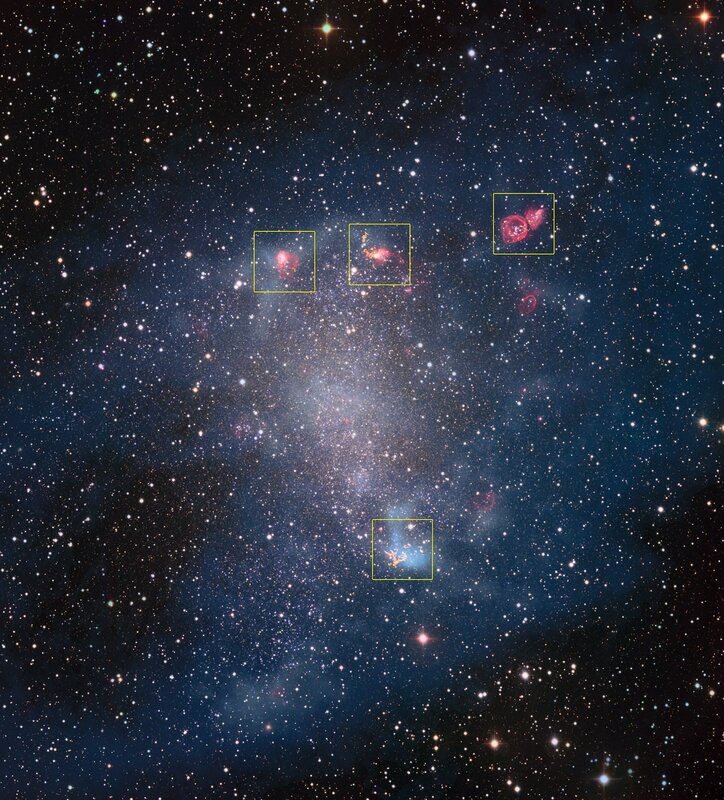 The observations by ALMA reveal the structure of star-forming gas clouds in unprecedented resolution. 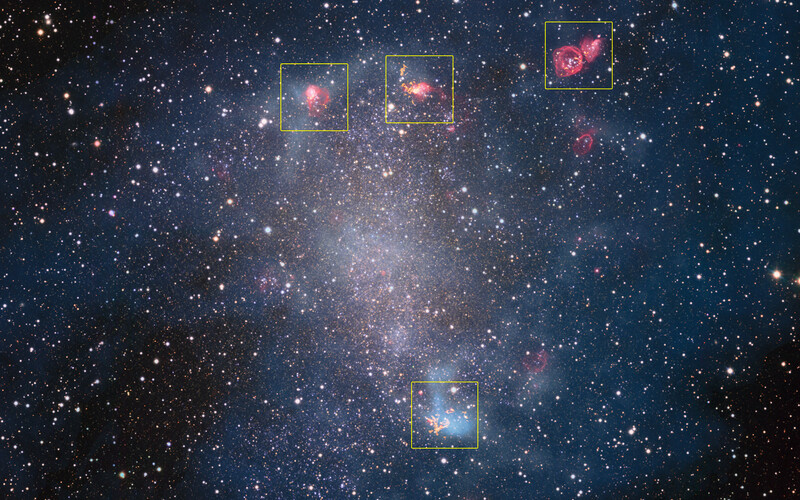 Observations in our own galaxy have shown that stars form in the dense cores of giant clouds of molecular hydrogen gas, the only places where gas can become cold enough to collapse under its own gravity. 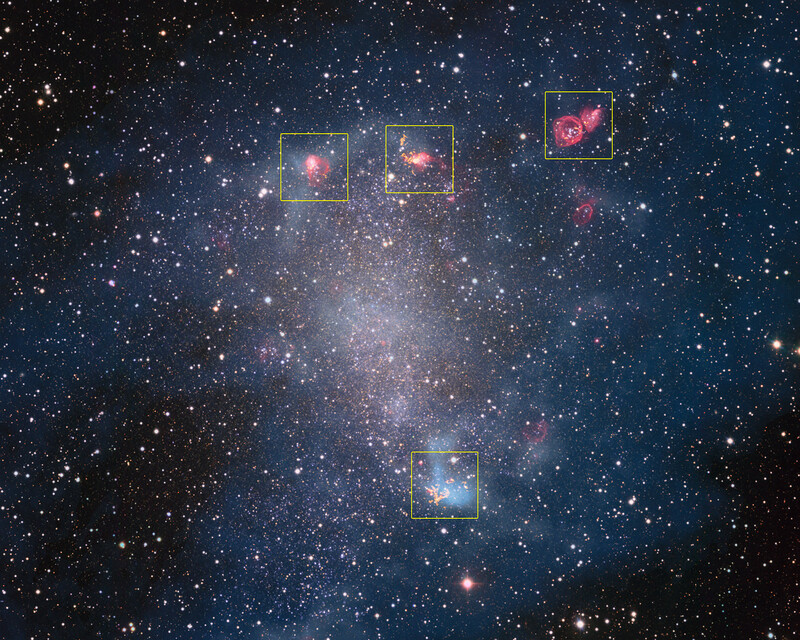 These conditions also foster the formation of other molecules, such as carbon monoxide, which are an indispensable tool in helping astronomers to detect galactic molecular hydrogen gas. 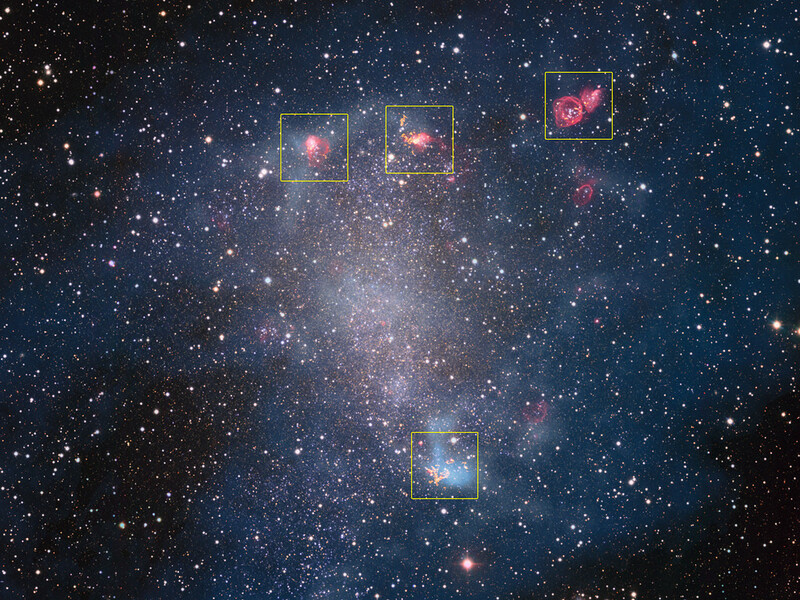 Until recently, astronomers have only been able to resolve star formation regions within the Milky Way — but now ALMA’s sharp sight provides a window into star formation in other galaxies. The analysis of the data revealed that, unlike in our own galaxy, the observed molecules are concentrated into small, dense cores of gas. This explains why it has been so hard to observe extragalactic star formation regions so far, especially in low mass, low metallicity galaxies. ALMA also found that the cores in NGC 6822 behave remarkably similarly to stellar nurseries in the Milky Way, indicating that the physics of star formation in these low-mass galaxies resemble that which we see in our own galaxy. Research paper by Schruba et al.